Move over Bionic Man and make room for BLEEX — the Berkeley Lower Extremities Exoskeleton, with strap-on robotic legs designed to turn an ordinary human into a super strider. Ultimately intended to help people like soldiers or firefighters carry heavy loads for long distances, these boots are made for marching. "The design of this exoskeleton really benefits from human intellect and the strength of the machine," says Homayoon Kazerooni, who directs the Robotics and Human Engineering Laboratory at the University of California-Berkeley. 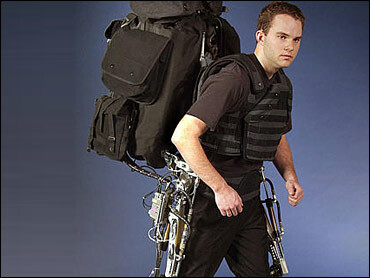 The exoskeleton consists of a pair of mechanical metal leg braces that include a power unit and a backpack-like frame. The braces are attached to a modified pair of Army boots and are also connected, although less rigidly, to the user's legs. More than 40 sensors and hydraulic mechanisms function like a human nervous system, constantly calculating how to distribute the weight being borne and create a minimal load for the wearer. "There is no joystick, no keyboard, no push button to drive the device," says Kazerooni, a professor of mechanical engineering. "The pilot becomes an integral part of the exoskeleton." In lab experiments, says Kazerooni, testers have walked around in the 100-pound exoskeleton plus a 70-pound backpack and felt as if they were carrying just five pounds. Eventually, the device could help rescuers haul heavy equipment up high-rise buildings or turn tired troops into striding super soldiers. What it won't do is turn you into a Borg, the gadget-happy gladiators of "Star Trek" fame. "The exoskeleton is not going to magically transform people into killing machines," says Kazerooni, known to his students as Professor Kaz. "They're really good, it turns out, at enabling firefighters, soldiers, post-disaster rescue crews to carry heavy loads over great distances for hours." So, no cyborg cops. But at least you get Terminator togs. Video of the BLEEX in action, which can be viewed at http://www.me.berkeley.edu/hel/bleex.htm, shows a steel-spiked symbiosis of man and machine, marching about to the techno-industrial drone of grinding motors. The next step for the BLEEX team is making the power source quieter and stronger and miniaturizing components. BLEEX is funded by the Defense Advanced Research Projects Agency, the Pentagon research and development arm, and was among the projects being showcased at a DARPA tech symposium this week in Anaheim. The project is one of scores in the field of robotics, which ranges from industrial machines that assemble cars to orthotics, surgical devices that activate or supplement weakened limbs or functions. Excitement about robotics was fanned by this week's DARPA-sponsored Mojave Desert race for fully autonomous vehicles, and the field is making strides worldwide. In Japan, a leader in robot research, Sony Corp. has developed a child-shaped walking robot, known as Qrio, and Honda Motor Co. has also developed a walking, talking humanoid robot. This spring, some Japanese companies plan to start marketing a "robot suit," a motorized, battery-operated device intended to help old and infirm people move around. The current favorite in the DARPA race came out of Carnegie Mellon University, where professor Matthew Mason is working on intelligent robots including the Mobipulator, which uses its wheels to move things as well as for locomotion. "There's just too much to do," says Mason. "Every time that there is an advance in computing, there are just so many more things that it becomes possible to do. Robotics is really about interfacing computers to the physical world so that their sensors give them a better concept of what's going on around them — they can make interesting things happen instead of just sitting there in their little beige boxes." Kazerooni isn't offering test drives of the exoskeleton. But if he were, Mason would be interested. "It looks really exciting," says Mason. "I'd like to try it on myself."